We offer various refresher courses for people who want to learn Ayurveda and Ayurveda massage training is provided by professionals at our Kerala Ayurveda Institute. Ayurveda courses have been framed judiciously keeping in mind various needs of different individuals. Ayurveda training courses in modules of 7 days, 14 days and 1 month are available. Theory - 1 hour/ day. Practical - 2 hours/ day. In theory sessions, Ayurvedic basic principles are taught in detail with relevant details for the practical are provided. 7 days Ayurveda Massage Training course starts on every Monday. Certificate is issued at the end of Course. 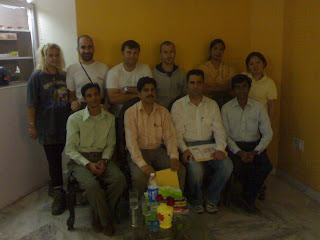 Total Cost of the 7 days Ayurveda Massage training course is Rs. 10,000/- INR. In theory sessions, Ayurvedic basic principles are taught in detail with relevant details for the practical are provided. 14 days Ayurveda Massage Training course starts on every 1st and 15th day of each month. Total Cost of the 14 days Ayurveda Massage training course is Rs. 18,000/- INR. Theory - 2 hours/ day. Practical - 3 hours/ day. In theory sessions, Ayurvedic basic principles are taught in detail with relevant details for the practical are provided. 1 Month Ayurveda Training course starts on every 1st of the month. Total Cost of the 1 Month Ayurveda training course is Rs. 30,000/- INR. Centre is open all seven days.